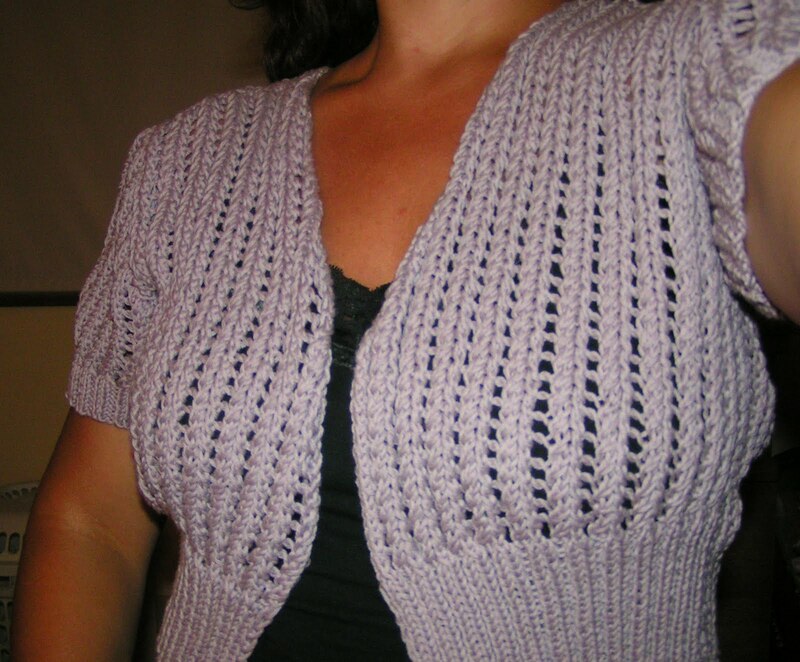 This is the finished cardi from my Tour de Fleece knitting. I had a bit of a problem with the Verena pattern - the waist yoke wasn't looking like the picture so I emailed for assistance and haven't heard back. I'm pleased with this new cardi. It's the Spring Fling pattern from knitty. I used Cotton Fleece and really like this yarn. It's a bit splitty but it's so soft. 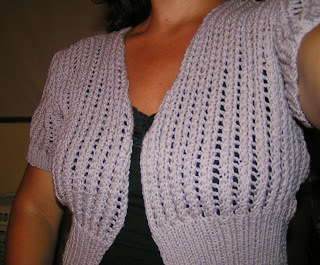 It only took two weeks to knit up, too, and I worked on other things at the same time. Oh, and Coggie talked about it on her High Fiber Diet podcast! Isn't that cool? Speaking of Coggie, she's asked for people to knit hats for the soldiers who are serving with her husband. The details are on her show notes page, so check it out if you're interested. I've stash-dived to find brown yarns to make a couple of hats. Since I've been out of the Random Acts of Kindness group I haven't had an outlet for my need to give so I'm adding this to the kidney cozies and animal shelter blankets that I'm working on this fall. I'm not trying to make anyone think I'm trying to make myself sound all big and wonderful. I have a big yarn stash and really need to do something with it - and although I love to crochet afghans we have quite enough blankets around the house. In other news, I have a Kindle! It's so cool. I've read two books on it so far and have put about twenty on it - some free ones and some that I bought. I also put several patterns on it, both to keep them safe if our computer dies and to knit from when they come up on my personal to-knit list. It's a gift from my family, a very early Christmas and birthday gift. I really enjoy it. Mom had me order one for her, too. I put about ten books on hers. She likes mysteries and thrillers, so our Kindles have very different content. I'd like to learn how to put some audio on it, too, but I'd hate for my ipod, Pinky, to get jealous. It's been a great summer for the pool. I'm in it several times each week. When the water got warm it stayed that way and I'm loving it. The kids don't get in it much. I'm not sure why, though. Perfect water, sunshine, floating noodles, and music sound like a perfect to me! Well, there's a project calling my name, so I'll be going for now. See ya later! Your Spring Fling looks sooooo much better than the picture on knitty.com. I want to knit the one you're wearing - but not the one I saw on knitty.com!